So, you have decided to venture on your new business.Let me congratulate you first because you have the belief in yourself that you can do it. You are not the one who would like to serve somebody else and let your company assure you the job security and take the responsibility of all your financial issues.You are different. You want to build your own empire and be your own boss, managing people under you. Having said that let us come out of this dream sequence and face the reality. To land up on a new business prospect is a difficult thing to do. It involves a lot of hard work than you can ever imagine. You have to lead the way for yourself as well as for others who are following you. You have to carve your own path to succeed.You need to consider all those factors which are needed to start a business. 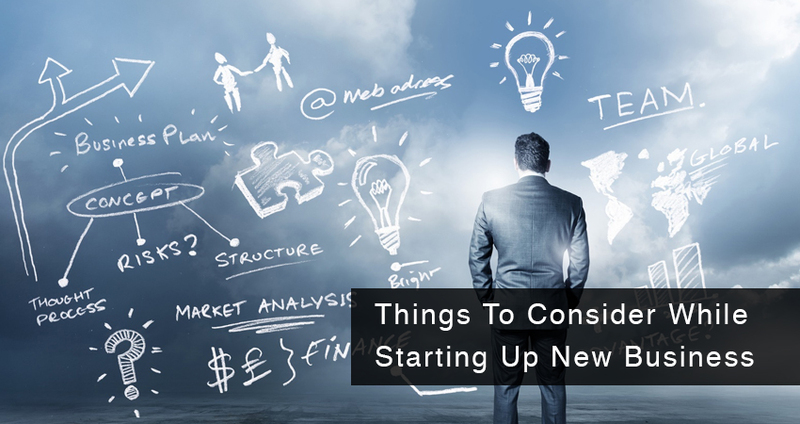 However, I say this not to baffle you but only to help you out with the things which you need to consider as your business start-up guideline. Yes, it is difficult, but not impossible as you might think! Know how: Whatever business idea you are coming up with, make yourself doubly sure that you already know a lot about it. Of course, it’s not possible for a person to know everything. But even if something is new to you, you should be able to assess and take a wise decision, so that you can hold your-self responsible and accountable on your decisions rather than losing charge to external forces and become helpless. Business Plan: After you are confident with the first one, make a business plan first. Make an estimated budget required and create a road map of your journey.This will give you an idea and an overview about the expected challenges and ways to navigate through. As is said, “If you fail to plan, you are planning to fail”. So, do it at the earliest and keep on updating it as and when required. Market Research: Survey the market thoroughly to know the need for your product and the range of the customers you would like to serve- lower, middle, upper, or high-end.Make the research as realistic as possible and avoid skewed results, whether you like it or not. Need for your product: You have decided on one thing to start your business with, which you find great. But do your targeted customers also feel the same? Find out if they really require the product or not. If not, find ways how to create a need for your product or even be prepared to change it if necessary. That’s what your peers do! Target Customers: You cannot satisfy everybody with your product. That’s a fact. So, chalk out who would be your targeted customers. This will help you to design the product, market it properly and satisfy your niche set of targeted customer. Promotions:Advertisements and promotions are an important part of business today. Learn to sell or hire able people who can do it for you. In this highly competitive market, everyone wants to top the chart to leave an impression on the mind of the customer, influencing him or her to buy the product. Know your competition: While surveying the market, also figure out your competitors. Study them thoroughly- their products, market strategy, customer service- everything. Not because this will help you compete with them but because they are in the market for some time and hence they are more Hence, you can learn something new from them. Also, it would be easier to single out where they lacked and you can work out how you can be different from them in overcoming their challenges. Get aware of the rules: Know the rules and regulations of your state and the tax laws while undertaking an endeavor.“You don’t know the rules” would be a lame excuse while being caught and your business may face a setback due to this one crucial mistake of yours. Organize yourself: Finally, when you want to start something new, inculcate some good habits in yourself, like, be open to learn new things, accept the changes and move along with them, avoid procrastination, try to know more about the great founders and pathfinders of all times and get inspired by them time and again. Philosophy of Business is similar to that of our real life. Ups and downs are a part of it.We need stay cool and positive in every situation.Let not a down situation distract you from your path. Always remember the reason why you started this business venture. Live through it. You will grow wiser and more experienced as you keep on handling every kind of situations. Share your thoughts and let me know if this helped you in anyway.